Leviton QuickPort® Feed through binding post connector for all QuickPort® wallplates, housings and panels. 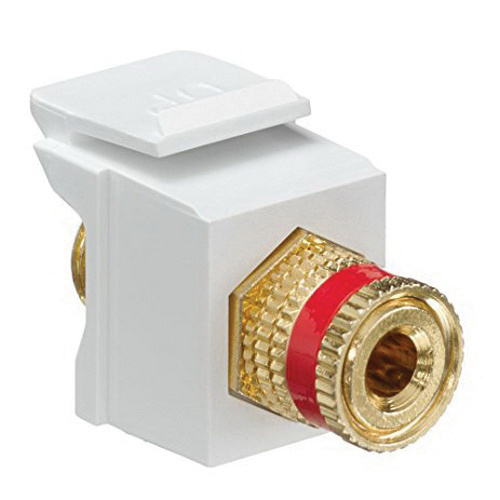 Surface/flush mountable connector features high-impact plastic construction. It has red stripe and white housing. Connector with screw terminal connection, supports surface/flush mounting for easy installation. It has a dimension of 1.16-Inch x 0.58-Inch x 0.64-Inch. The QuickPort® blanks aid to secure unused ports present in the wallplates as well as housings for future expansion. Flame retardant connector is UL listed.